How to tie the Bobber Stopper Knot. The bobber stopper knot is tied on the line above a sliding fishing bobber. The knot grips the line at the location you want the bobber to stop at for the depth you want to fish. 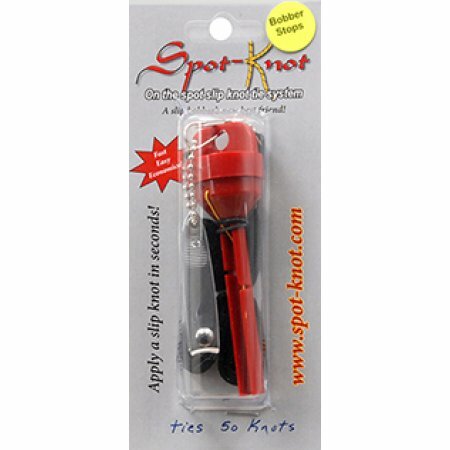 The handiest thing about the knot is that it can be reeled in past the eyes of the fishing rod for casting and then as the bait settles to the desired depth, the bobber slides up the line until it hits the stopper knot. This allows for deep bait presentation without being impeded by the bobber on the cast. Dacron fly line backing works well for the float stopper knot. Scroll to see Animated Bobber Stopper Knot below the illustration and tying instructions. The knot should be made with about 6 inches of line, usually the same diameter as the line itself, or with Dacron. Lay the stopper line against the fishing line at the chosen point and double back forming a loop. Hold the loop where the stopper line crosses over itself and the fishing line. Take two or three turns around both lines passing through the open loop each time. Pull the two ends in opposite directions to tighten down the knot.